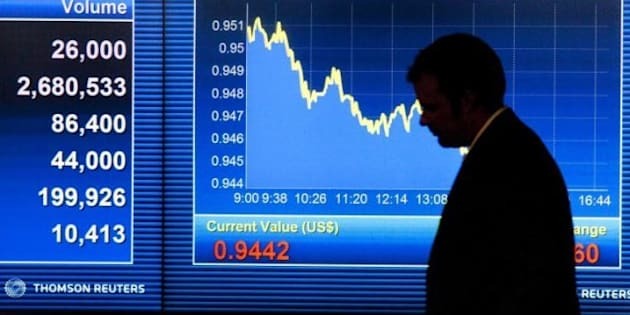 TORONTO - The Toronto stock market tumbled more than 300 points Wednesday and commodity prices retreated amid a fresh wave of anxiety about Europe's debt crisis. The S&P/TSX composite index fell 332.64 points to 12,156.22 as traders worried that Italy's borrowing costs are becoming too large to handle while talks aimed at establishing a new government in Greece disintegrated. The TSX Venture Exchange fell 48.67 points to 1,621. The Canadian dollar closed sharply lower as traders sold off risk and bought up safety in the form of U.S. Treasury bonds. The loonie fell 1.31 cents to 97.88 cents US. Markets had responded enthusiastically Tuesday after Italian Prime Minister Silvio Berlusconi won a confidence vote but said he would resign after his government's new austerity budget was passed. But pessimism returned with a vengeance as the country's 10-year bond yield jumped above the seven per cent amid questions over who would steer the country through its debt crisis. "All it does is add more uncertainty," said Chris Kuflik, investment adviser at ScotiaMcLeod in Montreal. "The bottom line is, if you need to negotiate with someone, who do you negotiate with?" The yield on Italy's 10-year bonds surged Wednesday to a high of 7.4 per cent, and later settled down to 7.07 after Italian president Giorgio Napolitano tried to reassure markets, promising that Berlusconi would soon be vacating the premier’s office. Bond yields in the seven per cent range are considered to be unsustainable in the long run. When Greece, Ireland and Portugal saw their 10-year borrowing rates rise above seven per cent, the markets concluded they had to be bailed out. The spike in yields also came amid a move by clearing firm LCH.Clearnet to raise the margin, or collateral, that traders must deposit to trade Italian bonds across all maturities. Italy is especially scary for markets because unlike Ireland, Greece or Portugal, its debts are too large for the country to be bailed out. "The biggest problem is those bond markets," added Kuflik. "What we're seeing now is the fear that this whole thing is going to become unravelled." Italy's woes had briefly shifted attention away from Greece, where power-sharing talks had been going on for three days. But the talks ended Wednesday, with political leaders failing to name a new prime minister who will take over from George Papandreou. The eurozone's debt crisis threatens the region's banks, its currency and there are worries it could derail an already fragile economic recovery. Slowing economic conditions would erode demand for oil and metals, which in turn pressures share prices of oil and mining companies on the TSX. Oil prices were lower with the December crude contact on the New York Mercantile Exchange down $1.06 to US$95.74 a barrel. It had briefly moved into positive territory after a weekly U.S. government supply report showed an unexpected decline in crude inventories. The TSX energy sector lost 4.08 per cent while Suncor Energy (TSX:SU) shed $1.85 to $31.44 and Cenovus Energy (TSX:CVE) lost $1.62 to $33.13. Other commodities headed lower as the December copper contract in New York lost nine cents to US$3.44 a pound. The mining sector fell 7.78 per cent as Teck Resources (TSX:TCK.B) dropped $2.52 to $37.73 and First Quantum Minerals (TSX:FM) retreated $3.23 to $19.76. Railroad stocks fell alongside resource companies as Canadian National Railways (TSX:CNR) gave back $1.56 to $79.06. Worries about the European banking system pushed the TSX financial sector down 2.3 per cent and Royal Bank (TSX:RY) declined $1.29 to $45.13 while Manulife Financial (TSX:MFC) shed 66 cents to $12.11. The gold sector was off about two per cent as the December gold contract in New York faded $8.30 to US$1,790.90 an ounce. Barrick Gold Corp. (TSX:ABX) lost 26 cents to $52.24 while Goldcorp Inc. (TSX:G) dropped 60 cents to $52.85. European markets also chalked up big losses as London's FTSE 100 index lost 1.92 per cent, Frankfurt's DAX fell 2.21 per cent and the Paris CAC 40 was down 2.17 per cent. There were also earnings reports from a variety of sectors to digest. General Motors Co.'s third-quarter profit fell 15 per cent to US$1.7 billion from a year earlier as the company posted a loss in Europe. Still, it was the GM's seventh-straight quarterly profit, and the lower numbers still beat expectations. Revenue rose 7.6 per cent to US$36.7 billion and GM shares fell $2.73 to US$22.31 in New York. Shares in home improvement retailer Rona Inc. (TSX:RON) gave back 17 cents to $9.39 as it reported net income of $50.1 million in its third quarter, up from $48 million in the same quarter last year. Revenues were $1.3 billion, up $27.9 million. Enbridge Inc. (TSX:ENB), a major oil pipeline operator and natural gas distributor, says quarterly profits were down to $4 million, or a penny per share, from $157 million or 21 cents per share a year earlier as it booked derivatives losses. Adjusted earnings, which filter out the mark-to-market values, increased to $241 million from $195 million and its shares were down 34 cents to $35.01. Silvercorp Metals Inc. (TSX:SVM), a Vancouver-based company which operates mines in China, has raised its quarterly dividend by 25 per cent to 2.5 cents. The move comes a day after the miner reported its latest quarterly profits jumped sharply on a 71 per cent increase in revenues. Its shares were down 35 cents at $9.27. Wi-LAN Inc. (TSX:WIN), which primarily collects licensing fees from companies that use technologies covered by its portfolio of patents, reported that its quarterly rose to US$7.3 million as it strengthened its revenues. The results were equal to six cents per share, compared to a loss of $6 million, or six cents per share a year earlier. Its shares were down 63 cents to $6.76. Quebecor Inc. (TSX:QBR.B) shares slipped 41 cents to $33.25 as it said its net income in the third quarter amounted to $26.1 million, or 41 cents per basic share. That was down from $56.9 million, or 88 cents per share, in the third quarter of 2010. Revenue during the quarter, however, was up $44.9 million to $1.01 billion, compared to $969.9 million in the same quarter last year.